Hawk-headed parrots are uncommon both in the wild and captivity. They get their name from the hawk-like appearance created when they flare their head feathers. As with most parrots, their strong, curved beak aids them when climbing and enables them to crack open the hard outer shell of seeds and thick skin fruit. 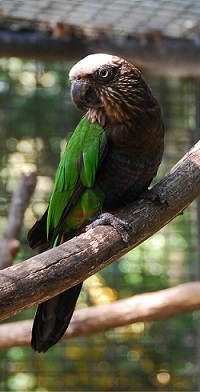 Like many other parrot species, the hawk-headed parrot is endangered due to deforestation and the pet trade industry.